We were very pleased to take part in Walpole Press Day this week, with the Savoir team heading down to Spencer House in central London to reveal one of our hottest new designs! The Walpole group includes 160 of Britain's most prestigious companies, and strives to exemplify the highest standards in terms of quality, style, design, craftsmanship, creativity, service and innovation - which was clear during the breath-taking event! As you can see in the pictures, the luxurious snow leopard Harlech bed we showcased features a subtle silhouette, contrasted with an extroverted leopard print design. 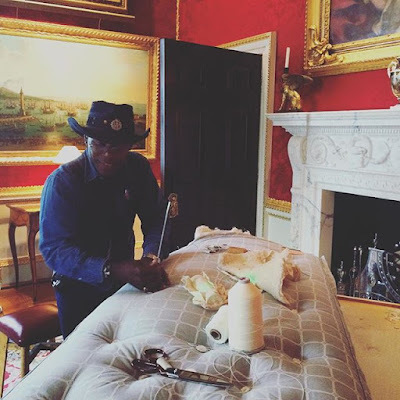 Adopting an exciting hair-on-hide fabric by Alma Leather, the bed looked fantastic against the regal background of Lady Spencer's bedroom! Our master craftsman, TJ, was on hand to show visitors how a Savoir mattress is made, while the rest of the team were ready to offer guests a much-needed lie down on the Harlech. TJ showing how it's done! 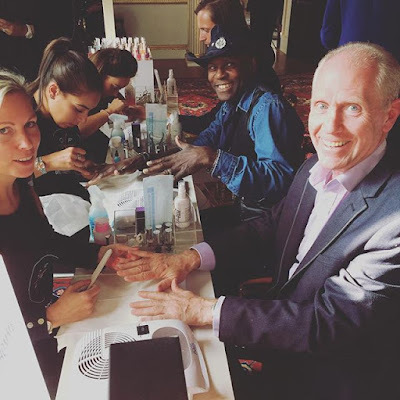 We also had time to enjoy a quick break to enjoy the event, as you can see TJ and Peter were keen to have a quick manicure with the lovely ladies from Only Fingers and Toes! With lots of other luxury brands including Boodles, Miller Harris, Cole & Son, The Savoy and Henry Poole all displaying their fabulous products, the event was certainly beautiful! At the end of the day, which took place on the same day Queen Elizabeth II became the longest-reigning UK monarch, we toasted Her Majesty and the success of the day with a glass of Royal Salute whiskey - delicious!